I would just make Rg 20Ω for +36 dB as you did. You don't ever want to add external resistors to the line receiver inputs if you expect to maintain CMRR. The absolute values of the internal resistors also vary by ±20%. You can use THAT1246 and lose 6 dB. On the MM preamp I tried that and it doesn't really improve noise. I would strongly advise against making Rg 20 Ohm. It will partly ruin your careful design. With Rg 20 Ohm, Flat noise will be 173.3 nV and after Riaa+A-weight 69.9nV with Rs 40 Ohm and Rload 100 Ohm. Flatnoise will be 111.2 nV and after Riaa+A-Weight 44.8 nV (again with Rs 40 Ohm and R load 100 Ohm). With the DL103 you will now have 76.5 dB S/N ref 0.3mV@5mV/sec, an improvement of almost 4 dB and still with an excellent CMRR. It would be a shame to simply throw 4dB overboard after having squeezed every potential noise contributor to its minimum. Been awhile since I looked at MC gain for flat recording and 36 dB isn't enough to be useful anyway so I'm not sure I proposed a valid case. One of them happened to come apart after unclipping it from the 4 wire meter. I thought the glass tube was cute enough to save and set it aside on the workebench. As I was picking up the end caps to throw in the trash I looked at them and thought "Would two ZTX851 transistors fit in here?" Back-to-back the E-line ZTX 851's fit neatly in the end cap. This may be the slickest and most easy-to-find way to thermally couple the devices yet. It actually looks like a real "3AG 1/4A" dual transistor. Much more real than the "nut-case" version. Two ZTX851 thermally-coupled by a 3AG fuse end cap. Cool! McMaster-Carr sells a few different potting compounds is small quantities. It’s under Adhesives for Electronics. I am very interested in this thread. I built a mic preamplifier using 4 modules based on the Grahem Cohen double balanced design. I am so found of this design, I wish to build more, but the major trouble is the availability of low noise matched bjts. Caracteristics look the same as LM194 LM394, but the AS194 AS 394 seem available at reasonable prices..... This looks too good to be true. What do you think: Is this real or clever fakery ? Thanks for joining us here terkio! I'm glad they started producing the LM194/394. The AS394 should be suitable for Cohen mic preamp designs but the 1.8 nV√Hz noise voltage alone is too high for a moving coil preamp. The LM394 has certainly been used in MC preamps but the ZTX851 will outperform it. The ZTX851/951 have much lower base resistance. The ZTX851, being a large-geometry part, also has a high output capacitance. On the other hand the AS394 has better Vbe matching and higher current gain. 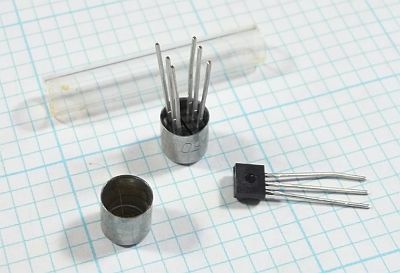 I went through a limited number of ZTX851 to Vbe match them and didn't have much trouble matching pairs within 100µV and they're cheap enough you could buy 100 of them to have your pick of the liter. Once I got a half-dozen pairs I went back and measured the Hfe which ran between 140-200. I really would like to advance this project. I've been out of stock on the flat moving magnet preamp for awhile and just got some back in. With those moving again it makes sense to finish the MC version. The Protoboard for it, along with a few others, is sitting on my bench. Thanks for your welcome and fast answer. I forgot to mention the preamps I worked on use two LM394 cross parallelled. Thermal bounding of 2 ZTX851 asks for a copper enclosure fat enough for thermal inertia, a copper tube closed on top, that extends a bit around the leads. The remaining temperature mismatch will creep in from the leads and PCB tracks. The servo is great to take care of temperature drifts, but: Using a servo, what about artifacts when changing the gain ? The Rgain of my preamps is made of a rotary switch 24 position commuting on a chain of resistors. Thanks to 'make before break' it switches gains nicely. I am afraid the servo cannot be good at all gain settings and will induce crakling noise when changing the gain and take ages to settle at low gain. Furthermore, I have 33uF caps in front for the 48V phantom power. If you have enough ZTX851 to chose from you can get some very close. The jig I used matched them simultaneously using a differential connection which helps. The M7 nut method of thermal-coupling does give it a lot of mass. In this particular design I didn't concentrate on servo settling since the gain is not switched. I am familiar with servo settling time in a mic preamp. At some time in the future I want to graft the ZTX851 front-end and the different method of servo injection used here into the input-capacitorless mic preamp. Being able to make the servo non-resonant single-pole by eliminating the input coupling caps and isolation of the mic's internal caps (if any) using a downstream servo injection point is a big bonus.